We are a team of professional and award winning film makers. IMPACTFest Educational Conferences re now in over 30 cities and growing! Our Festivals will showcase your selected Virtual Reality films, Short films, Robotics, A.I and Games -- providing the awareness your work deserves. Attend our International Conferences for Immersive Technologies. Meet the people who are shaping the future of content. 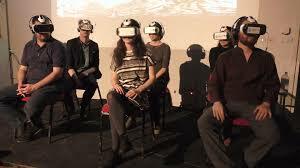 See exclusive VR Film and Gaming Screenings. IMPACTFest Global Find Out Who we Are!